Tremblant is a bit like Euro-Disney on snow, we decided on a recent family ski trip. The resort villag e in Quebec brims with candy colored condos, animated architecture and themed restaurants all nestled at the base of a family sized ski mountain. Sounds cutesy and quaint, and it is – like Europe only closer and cozier. It’s one of the best Quebec ski resorts and the Northeast for families. Young families will find a magic kingdom on snow at first glance. Tremblant is also big business– with skier visits hovering around 2 million per season. This Intrawest real estate development ripples out from the original skier village and around Lake Tremblant. It’s well planned with underground parking and a pedestrian village the likes of Vail with the ambiance of the Alps right down to the French cuisine, language and joie de vivre. 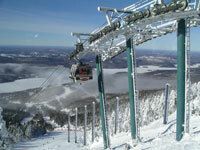 The skiing encompasses four unique faces on Mont Tremblant which peaks at 2,871’; with 96 trails and a total vertical of 2,116’ served with 14 modern lifts (the centerpiece is a base to summit 8 passenger gondola). On a clear day Tremblant is incredibly scenic as you descend toward the pretty village and frozen Lake below. 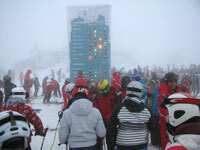 On a weekend Tremblant is tres popular too with a traffic light at the summit (where many lifts converge) indicating lift line wait times. Tremblant’s 665-acres spread from the South Side facing the village to the North and Versant Soleil (the sunny side). Tremblant has serious snowmaking on the majority of its trail system, plus a secret stash of natural glades (sous bois in French) in The Edge area. There is certainly skiing for every level – and nothing terribly challenging. Tremblant’s expansive “ecole de neige” (snow school) is well known for its exceptional kids’ camp taught in French and English. Although Quebec is a French speaking province, we felt comfortable in this touristy resort (everyone speaks English too) and our US money was accepted en par. But we immersed ourselves in the Quebecois culture with croissants, fondue, and après ski. With 40 restaurants and bars, Tremblant rocks after the lifts stop. Tremblant is historical too, started in 1939 by an eccentric Philadelphia millionaire as the first ski resort in the east (second only to Sun Valley in Idaho). 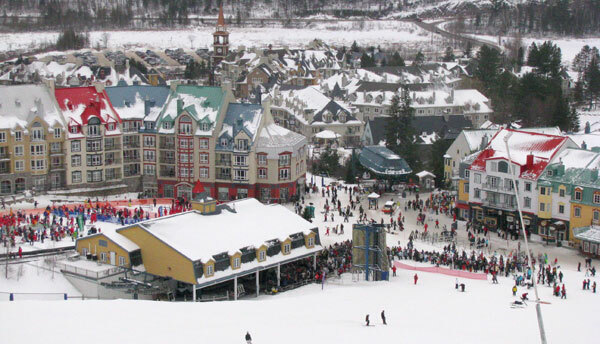 If you can’t swing a family ski trip to Europe, drive to Tremblant for a Euro-style vacation. While not as authentic as 400-year old Quebec City , Tremblant is fun, French, and offers the full resort experience with ice skating on the lake, an amusement park swim club called La Source, a movie theatre, even a pottery studio. 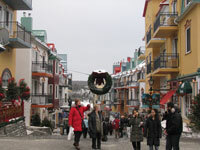 Try to visit Tremblant midweek, when it’s not as busy (and not such a party scene). For families, it’s like Disney on skis and Europe without the airfare, passports are required at the Border. For couples, Tremblant is extremely romantic and entertaining, skiing is a mere amenity. There is even a Casino on mountain reached by gondola, which seems incongruous for a ski resort, but that’s Quebec for you.